from the highway A9 direction Nürnberg: Follow the ring road (Mittlerer Ring) direction "Lindau". Take the highway A96 towards Lindau. Leave the highway at exit 37 "Blumenau" direction Hadern/Großhadern. Turn left onto "Waldwiesenstrasse" and after 950m turn right onto "Würmtalstrasse". Follow the road for 1.2 km before turning left into "Am Klopferspitz". The Biocenter is the red building on right. For parking use the large public parking area on your right. from the highway A8 from Stuttgart follow the A99 towards "Garmisch-P./Lindau/Schweiz". At the interchange "Dreieck München-Süd-West" stay in the left lane and follow the signs "A99 Garmisch-P./München-Sendling/München-Zentrum". Leave the highway at exit 37 "Blumenau" direction Hadern/Großhadern. Turn right onto "Waldwiesenstrasse" and after 950m turn right onto "Würmtalstrasse". Follow the road for 1.2 km before turning left into "Am Klopferspitz". The Biocenter is the red building on right. For parking use the large public parking area on your right. from the highway A95 from Garmisch-Patenkirchen of from the A8 from Salzburg enter the ring road ("Mittlerer Ring") and turn left at the Luise-Kiselbach Platz onto "Waldfriedhofstrasse". Follow this road for 4.2 km via Würmtalstrasse. At the traffic lights at the Campus turn left into "Am Klopferspitz". The Biocenter is the red building on right. For parking use the large public parking area on your right. 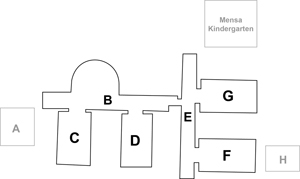 When arriving at Munich central station (Hauptbahnhof) by train take the subway line 1 or 2 (U1: direction "Mangfallplatz"; U2: direction "Messestadt Ost") and get off at "Sendlinger Tor". From "Sendlinger Tor" take the subway line U6 towards "Klinikum Großhadern" and get off at its final stop "Klinikum Großhadern". Exit the subway station following signs to bus line 266. Take bus 266 towards "Planegg" and get off this bus at the stop "LMU Martinsried". Get to Munich international airport (MUC). If you want to proceed by public transport, take the S-Bahn (S1 or S8) to "Marienplatz" and change to the subway line U6 towards "Klinikum Großhadern". Get off at the rear of the train at its final stop "Klinikum Großhadern". Exit the subway station and take the bus line 266 towards "Planegg" and get off this bus at the stop "LMU Martinsried". It will take you about 40 minutes to reach the city center and another 25 minutes to get to the Biocenter. To find individual people and rooms please follow the map aside. A room number (e.g. E03.043) is comprised of the wing of the building (here: E), the floor (here: 03) and the room number itself (here: 043). Large scale maps of the building can be found on the side walls of the elevators at the interzone B/D and E/G. Please notice that any companies or representatives have to report to the security desk at the main entrance (building B) first. 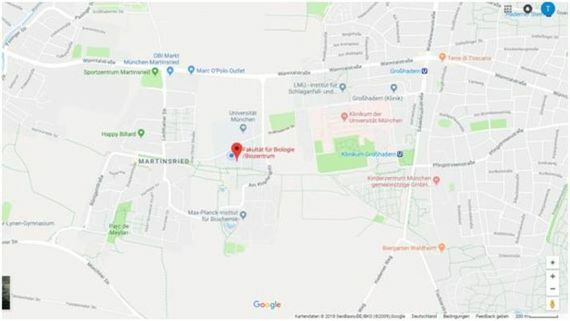 Here you find a list with some suggestions of hotel in close proximity to the Biocenter and along the subway line U6 that connects the city center with the Campus Martinsried (pdf file).